Like all good ripping yarns there is a huge amount of author’s license in this sorry, but heroic, tale. The tale began when the warlike kingdom of Batter, lead by their Great King Aldo Menelaus and arch-conspirator General Leon Agamemnon, challenged the peaceful but drunken kingdom of Hammer to a fight-to-the-death chess match over thirty boards. The Batter intention was to seize back the legendary El Chessico trophy that had been won by Hammer in a previous skirmish. Batter contended it had been stolen and craved it greatly. They were seduced by its power and beauty. Legend has it that it could launch a thousand chess openings and this knowledge was prized beyond all by Aldo Menelaus. This battle would be about dominion, power, the 64 squares and bragging rights in the South and West of Londonium. The march to war was littered with social media banter, critical negotiations and final agreement – sounds a bit like Brexit?? – and resulted in the agreed showdown at the home of Batter on the sixth day of the eleventh month in the year of Our Lord 2018. The scene was set; the die was cast, and both tribes arrived to face their doom. Batter called on its mightiest warriors Achilles, Partroclus and Diomedes. Whilst King Priam Clueless of Hammer relied on the stalwarts of Hector, Paris and Aeneas. The magnitude of the task facing the Hammer team was huge – enemy territory and two defaults before a pawn was moved in anger. With both Alex and Ken not able to make it at the last minute – a tough mission just got even tougher. To quote some classic football parlance, it was a match of three halves – yes please, get your head around that. For simplicity sake, we will take the three halves as boards 1-10, 11-20 and 21-30. I guess three mini-matches within one big match. There were some great games here. Ryszard, aka Paris, downed his opponent with a tour de force utilizing the bishop pair to arrow in on the white king and down his formidable opponent. He literally targeted his opponent’s Achilles heel and the game is very instructive and well worth study. Board 2 saw Thomas push hard with the initiative but with not enough of an edge to convert into a well-deserved victory. Hostilities were brought to an end by a mutually agreed draw. The next two boards saw Hammer heroes Paul and Pavel fall after full-bloodied encounters and Hammer were now, on paper at least, three points down. Fortunately, Jeremy played an amazing game and in noble Hector-style, deflected his opponent’s Queen and rook to the wrong side and part of the board. His pieces then swooped in on the denuded Black King and he triumphed and put a great point on the board. Hopefully, we will be able to publish the game at a later date. Sitting beside Nadhmi while he plays chess is just a pleasure – he combines a deadly combination of perfect innocence with dead-eye accuracy. He tactically outplayed his opponent, winning a piece, and then converted his advantage smoothly. Hammer now just trailing by one point. King Clueless and Brian agreed draws after bitter tussles and the scoreboard gap stayed frozen. However, along came Adam and Charlie. The former, displaying all the calm of Trojan hero Aeneas, employed his favourite London System and won a piece with a deadly pin and then was error-free in his win. Charlie decided to be liberal with his pawns and thus created multiple threats for his opponent. There may have been a defence, but time played its part and Charlie coolly walked away with another Hammer win. The Hammer crew had nosed in front overall by a point but had won this mini-match 6.5-3.5. Boards 11-20 were even more bitterly contested. The first two boards saw contrasting fortunes for the Hammers. Simon’s game was the first finish – he won at a canter. Whilst David had one of those nights where you defend tenaciously, win a pawn and move onto the offense. He was winning and had everything covered. Alas, one mis-move allowing a bishop pin lost his extra pawn and the game soon dissipated down to a draw. This was definitely a tragic near-miss of a win. The next two boards saw Dipender fighting tenaciously but ultimately fruitlessly whilst Alex had sadly defaulted. Hammer on paper were still a point ahead but things were getting tight. 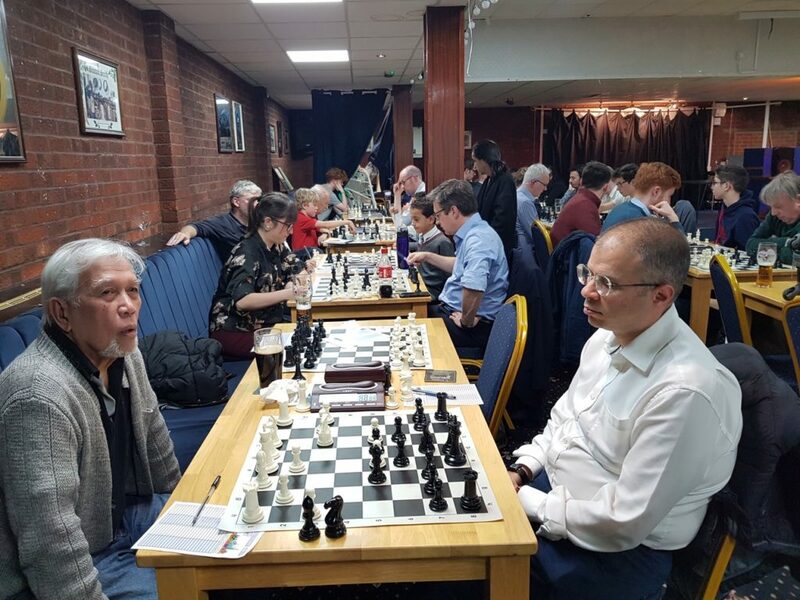 The next two boards (15 and 16) saw Ben, despite arriving late, do his stuff and win fairly quickly, whilst Robin took on General Leon and went down in flames. 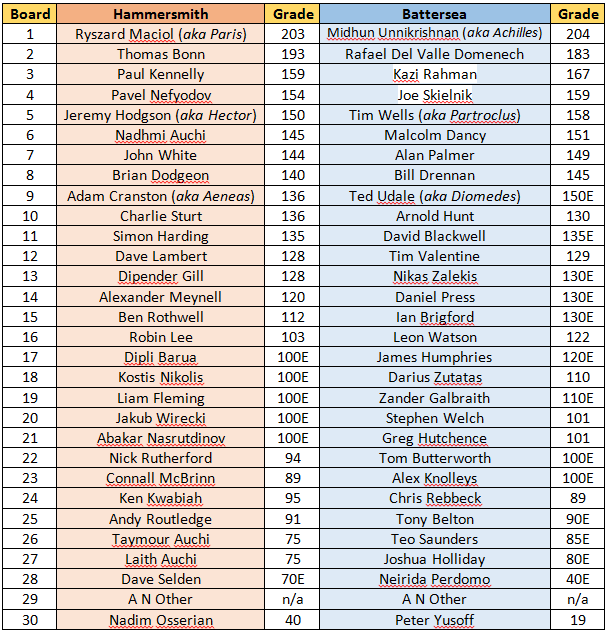 Just a point separating the teams overall – it was developing into a Virgil epic. The next four boards saw four Hammers, Dipli and Kostis (the relatively new newbies) and Liam and Jakub (definite newbies) take on their opponents. The tale of the tape shows that Jakub won his individual battle, whilst Liam and Kostis drew – Dipli sadly lost. She is such a good player, I know she will back stronger. Although we had lost this mini-match, Hammer were still two points ahead. It would all come down to the battle in mini-match three – the fate of El Chessico was in the hands of the fighting Hammer Trojans. 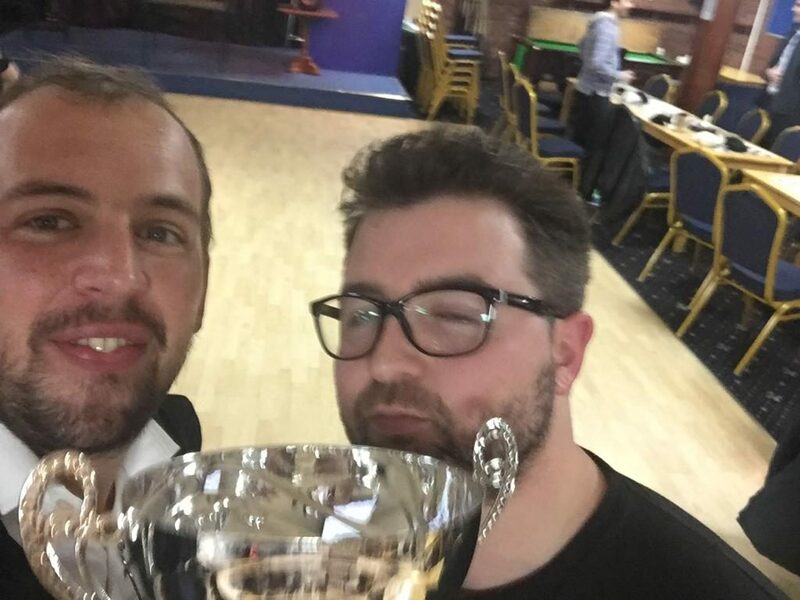 Our seasoned campaigners, Nick and Nadim, had a draw and a win apiece – Hammer nudging closer – and Dave making his debut in the Hammer colours despite being materially ahead, fell into a Stalemate scenario. A final push was needed and this is where Hammer played its reverse Trojan horse manoeuvre and the talents of Abakar, the Auchi twins, Connall and Andy “Spidey” Routledge were unleashed. The famous shock-troops of Troy. A tour de force from the Taymour and Laith saw their junior opponents totally overawed, with both achieving dominance in rapid victories. The other three Hammers held their nerve: five games and five wins was the result – the city was saved – and made the second Hammer default meaningless. El Chessico was safe and bragging rights are definitely still residing north of the river. 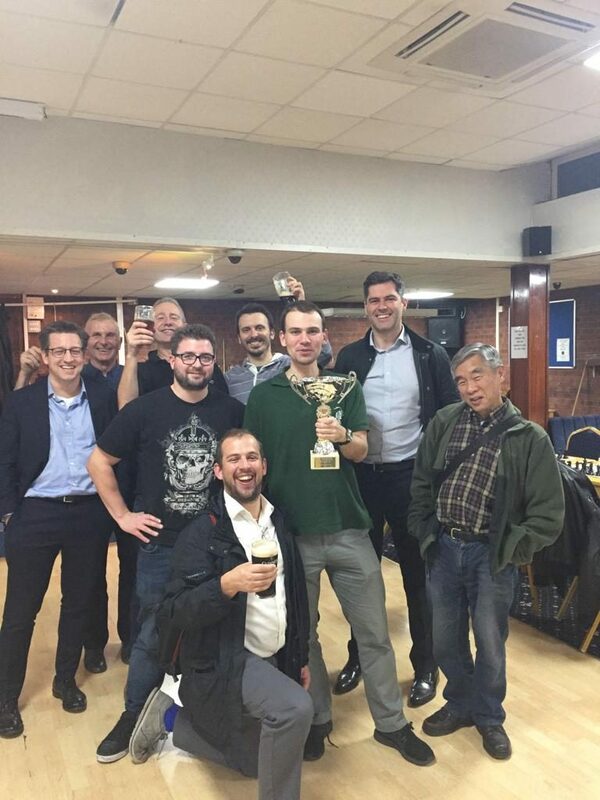 It was a great, great evening and with trophy in hand another Hammer triumph was noted when Dave won the raffle prize for a WCC ticket. Basically, Hammer were like Hermes – fleet of foot, and gracious in victory. I must thank Aldo, Leon and their captain Gregg for staging the event and wish them and all the Battersea family the best for this season. Roll on the next encounter – the noisy neighbours may have been silenced for the moment, but believe me – they will be more ferocious and desperate next time. King Priam Clueless signing off and paying homage to the Hammer heroes. Great report, Priam! For the glory of Hammer!! Eo Loco I can but agree….Homer knows a thing or two….